DC Comics, oh my! Injustice: Gods Among Us is just two months away. Peep inside to see Maximilian's thoughts on the upcoming NetherRealm fighter. 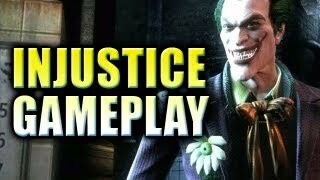 Maximilian has posted some gameplay to go along with his thoughts of Injustice: Gods Among Us. Featured in the video are The Flash, Shazam, The Joker, and Lex Luthor. The footage is from the second Battle Arena.